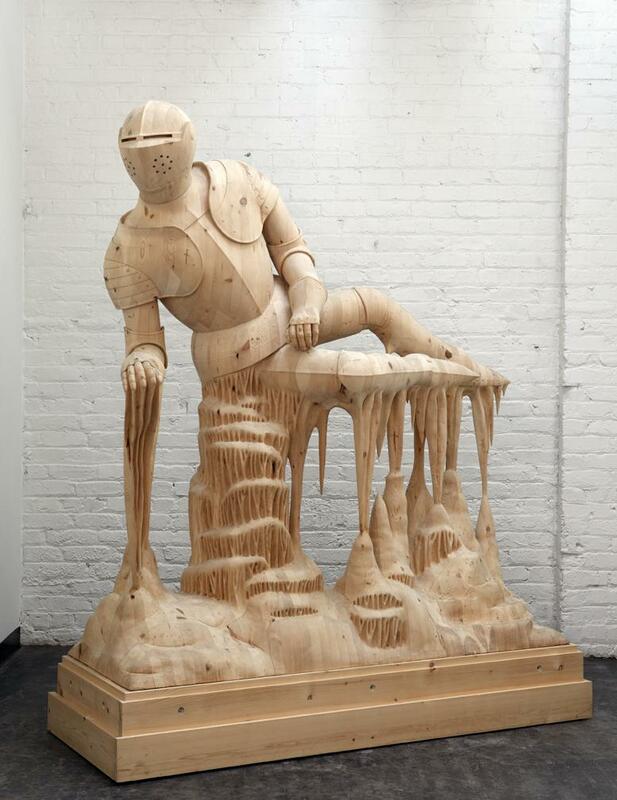 Untitled (Knight) by Morgan Herrin combines various disparate themes: a knight in 15th-century armour lying, in a pose reminiscent of the classical Roman sculpture "The dying Gaul", on a series of stalactites and stalagmites that might have been taken from an underground limestone cavern, with water dripping over them. "I gradually became addicted to wood." 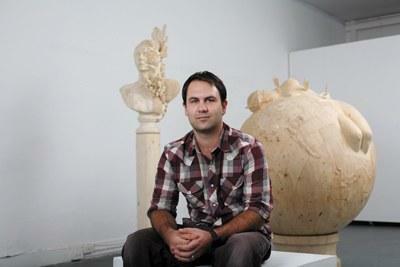 35-year-old American wood sculptor and art teacher Morgan Herrin is fascinated by Roman statues from antiquity and has been making outspoken, hand-carved sculptures with a classical theme from recycled wood for the past 11 years. His studio in Richmond in the American state of Virginia is where he creates his unique large-scale, meticulously detailed artworks out of lumber, very cheap, left-over material from construction sites or movie sets - typically construction 2x4s. His work is becoming increasingly well-known in America and has been shown in various exhibitions - and is now attracting the interest of European art lovers due to the unusual forms and surrealist symbolism of his sculptures. The making of such large works of art, which can be up to 7 feet tall, is a very time-consuming activity and may take as much as 6 months to a year. "I mainly use pine wood," Morgan explains, "which is the cheapest and the hardest to carve." Morgan Herrin, who studied sculpture at Virginia Commonwealth University (VCU) for about 6 years, grew up in Dallas, Texas, but moved to Virginia at the age of 18 to take advantage of the excellent teaching facilities at VCU. The VCU Arts department, and the school of sculpture, have top ranking among public univerrsity programmes in the USA. Morgan, who also worked as a carpenter for 10 years from the age of 20, started carving in styrofoam, but soon changed to wood. "I started working with wood at a certain point, because as a carpenter I became addicted to it. I was making decors for movie sets, so I could get hold of lots of wood left over from the sets that I was working on." Morgan Herrin posing in front of The Globe, one of his most impressive works, which shows a recumbent woman pierced by arrows, half swallowed by the globe. In Herrin's exuberant imagination, he sees her as half-woman, hard-bird, brought down by a hunter over the Atlantic Ocean. "The aspect of time in a statue intrigues me." Morgan Herrin started to create surrealistic, classically inspired sculptures from giant blocks of laminated construction-grade 2x4s. He went to Rome for some time, where he took some courses in art and architecture, and on his return to America he studied the history of art. He gradually focused increasingly on antiquity. "I have been interested in classical statues for a very long time. I could spend hours reading about them in books, and became really obsessed with them. The older and more damaged the statue, the more I became fascinated. I studied the way the artist made them originally and how they developed through time. The time the artists worked on the statues and the time that elapsed since their completion added a new dimension to the works of art. The way time altered the artist's original intention fascinated me, leading me to fall in love with Classical figurative art. I am inspired by historical events and archaeological finds too, especially those related to art. It really interests me when circumstances or age turn a work of art into an artefact." Morgan Herrin integrates aquatic animals into many of his artworks. Here we see a woman with an octopus on her head, killing an eel with her sword. "I could draw for hours as a boy." Morgan Herrin was very creative as a boy. "I was always making things and would spend hours drawing. But my fascination for wood grew during my study. I think it's a wonderful material. In fact, it's unique, because it is the flesh of a dead organism that we can shape into whatever we want. There is something really nice about that. It is the vonly material that is like that. The challenging thing is that I work with wood of very low quality, which is difficult and time-consuming - but interesting - to carve. I was also fascinated by the octopus and the eel, and their underwater existence. So I made a sculpture of a heroine with an octopus around her head, killing an eel with a sword." (See photo left.) "This was the very first wood-carving that I did. It sort of evolved as I was working on it. I initially wanted a woman who had crystals growing on her. But it was not working out, I needed a different form. So I started looking at sea life a lot and found it a challenge to do the octopus. It has a very complicated form. I like to think of the octopus as something like a human head with human hair." This sculpture by Morgan Herrin is a new interpretation of Boudica, the queen of the British Iceni tribe, who led her people in an initially successful uprising against the Roman occupiers. 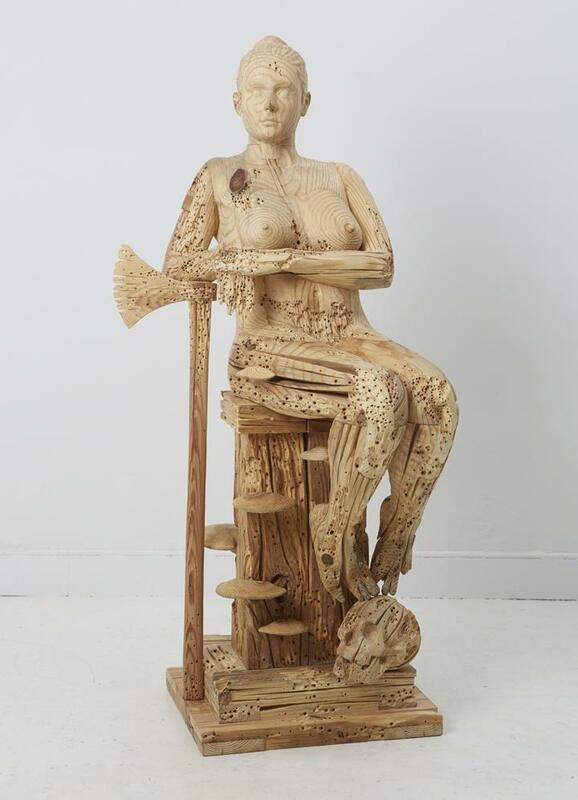 Morgan Herrin is very interested in female figures, and likes to portray heroines in wood. "It is just my fascination with history. There are so few heroines in history who are portrayed in Classical sculptures," he says." So I wanted to recreate them in wood. Like the warrior queen Boudica, who won fame for her bravery in leading her people of the Iceni tribe in an uprising against the power of the Roman forces occupying Britain. Boudica has become an important important cultural symbol in the UK. She died, possibly by her own hand, in AD 60 or 61. 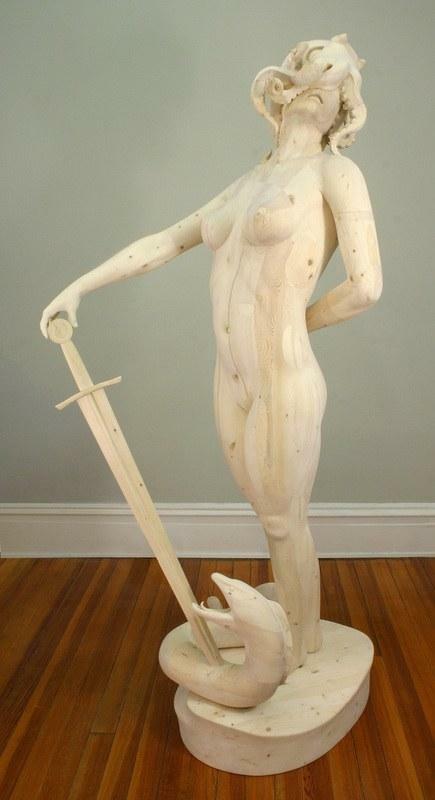 The sculpture of Boudacia shown in the photo on the right, made from aged lumber found in a house more than 100 years old in Richmond, Virginia, rather than his usual construction-grade 2x4s, shows Morgan Herrin's idiosyncratic view of the warrior queen. Morgan Herrin likes to combine man-made and natural elements in his work, within the framework of a Classical form. "I combine these two factors in many of my sculptures," he explains. "For example, The Knight (see the photo at the head of this article) contrasts the smooth, hard surface of the plate armour with water dripping over the stalactites and stalagmites. I wanted to see how it would look to combine something completely fluid with a geometric, man-made element, something solid like the knight's armour. And then there is the added challenge of using the solid wood to mimic a liquid element. I have always loved the fascinating forms you find in nature, not just the rock of the stalagmites but how the way the dripping water can cover and transform it." "My work is ultimately a result of my fascination with the figurative sculpture of the past and obsessive research into a particular subject," Morgan adds. That is how he recently got the idea of making a sculpture entitled "Ötzi the Iceman", inspired by the well-preserved natural mummy of a man found in September 1991 in the Alps near the border between Austria and Italy. Investigations showed that he had been frozen there for more than 5,000 years. The mummy was called Ötzi because it was found in the Ötztal Alps. It is the oldest known natural mummy in Europe, and is displayed in the South Tirol Museum of Archaeology in Bolzano, Italy. 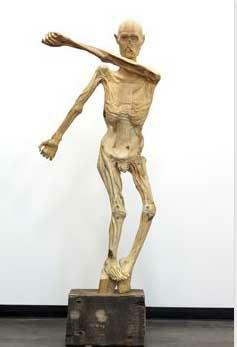 Morgan Herrin was keenly interested in the mummy, especially in its posture: the arms are frozen in such a position that it looks as if Ötzi is swinging them about his body. Morgan decided to make a wooden sculpture of the mummy. "I was fascinated by the strange pose of his arms and the way he stood. I tyhought it looked like a strange form of crucifixion. And I was impressed by the fact that he had been preserved in that position for 5,000 years, making this one of the most important archaeological finds of the past century. I still have the sculpture in my collection."